David Hare is the finest, British, living playwright. And his play, The Judas Kiss, playing at the Ed Mirvish Theatre in Toronto, is perhaps his best. In tracing the story of Oscar Wilde’s betrayal by his young lover, Lord Alfred Douglas, Hare succeeds, not only in skillfully telling a true tale of passionate intrigue, but in touching the soul of what it means to love. taking risks, losing friends who don’t agree with your choice of partner, trusting the wrong people and being rejected. This is all familiar territory. What is different is the scale on which it occurs. At the peak of his international writing career in the last decade of the 19th Century, Wilde risks his reputation for a partner who never seems to acknowledge the caliber of his genius. Although the audience questions why so great a man would sacrifice so much for so little, the emotional storyline is true to life. Wilde seems to only have one friend he can count on – Cal MacAnnich as Robert Ross, or Robbie, who puts in the finest performance in the production – begging Wilde to leave his young lover, Bosie, and flee the charges of “gross indecency” filed against him by Bosie’s father, the Marquess of Queensberry. Robbie cares for Wilde in a way no one else appears to, and his compassion, frustration, and anger against Bosie, are palpable. Through Robbie’s devotion to Wilde, the audience gains sympathy for a man with far too many weaknesses. Charlie Rowe is spot on as Lord Douglas, or Bosie, as his friends called him—oozing with charm, charisma, callousness and insensitivity. He moves with the ease of the privileged, and words fall out of him like honey on warm toast. It’s not easy to like Wilde, because of his clear self-loathing, but it is easy to love him. Everett heightens Wilde’s vulnerability, his humanity, his humour, his ability to observe, and wisely forgive. Everett aptly demonstrates Wilde’s ability to forgive against all odds. 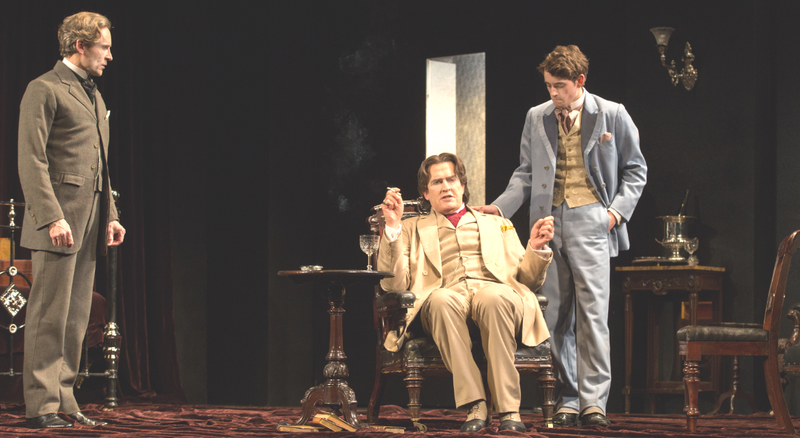 In spite of Bosie’s superficiality, selfishness and betrayal, Wilde manages to accept his lover’s foibles, and in so doing, encourages the audience to forgive his own. Director Neil Armfield, does a fine job of pulling all the pieces together to effectively convey the meat of the text. The script is honoured. The acting, lighting, set, music and sound effects are all underplayed, until they flow together in a blended harmony in patronage to the power of the words – Wilde’s strong suit. Lovely lighting effects by Rick Fisher, bring a hint of hope and redemption to a very dark story. Intermittent bursts of music, composed by Alan John, set the somber, yet triumphant, mood. In spite of the fact that Wilde is a tragic hero, this play is not depressing. The fact that Wilde manages to face up to himself and his betrayer, is a testament to the human spirit. Hare has written a masterpiece. The Judas Kiss is playing at the Mirvish Theatre until May 1st.